Archives : OPTIMISM RETURNS WITH P.C. - 03/08/2012. OPTIMISM RETURNS WITH P.C. – 03/08/2012. BEARISH GAP TO BE TESTED. Market bounced back after testing the long term support of 200dma. The bounce back coincided with Mr. P.Chidabaram being appointed the new FM. The market now expects Reforms process to start under the new FM, which is the reason behind this pull-back. However a close above Nifty 5242 will complete a small bullish reversal pattern and will provide further impetus to the market. The test for the market will be the bearish gap between Nifty 5267-5300. Sensex opened the week at 16919, made a high of 17291, low of 16919 and closed the week at 17197. Thus it registered a weekly gain of 358 points. At the same time the Nifty opened the week at 5129, made a high of 5246, low of 5129 and closed the week at 5215. Thus the Nifty went up by 116 points on a weekly basis. Both Sensex and Nifty made an Opening White body Marubuzo on the weekly charts. If we consider last three weeks candles, it could have been a Bearish Downside Gap Three method which is a Bearish continuation pattern. But it is not because the first candle has a small body. On the daily charts, a small white body candle has been formed which seems to be a part of overall consolidation. This candle has long lower shadow and a very small upper shadow. The long lower shadow is indicative of buying strength at lower levels. Thus candle sticks on the daily and weekly charts look promising. This week both Sensex and Nifty filled and closed above the first Downward Bearish Gap between Sensex 17129-17047 and Nifty 5197-5164. This has provided bullish momentum to the market and now the main test will be the second Downward Bearish Gap between Sensex 17329-17466 and Nifty 5261-5300, which will act as strong resistance. Currently the markets have bounced back after testing the 50% Retracement of the correction of the rise from Sensex 15748 to 17361 and Nifty 4770 to 5348. The correction levels are 16912-16690-16469 for the Sensex and 5127-5059-4991 for the Nifty. On a longer time frame both Sensex and Nifty are undergoing a pull-back of the entire fall from Sensex 21108 to 15135 and Nifty from 6338 to 4531. This pull-back will resume once the Sensex closes above 17631 and Nifty 5348. The pull-back levels are 17417-18122-18827 for the Sensex and 5221-5434-5648 for the Nifty. This week both Sensex and Nifty have moved higher after testing the long term average of 200dma (Sensex – 16885 and Nifty – 5106), medium term average of 50dma (Sensex – 16943 and Nifty – 5139) and short term average of 20dma (Sensex – 17147 and Nifty – 5202) and have closed well above these levels. As a result the trend in the long term, medium term and short term timeframe have all turned Bullish. Market is now well above the level of the Falling Channel Top which comes in at Sensex 15919 and Nifty 4820. These levels should now provide Support for the market. The overall bullish long term target for Falling Channel pattern breakout remains intact. The targets as per this formation are Sensex 20383 and Nifty 6148. MACD has given a fresh Buy signal and has also turned positive. ROC remains flat near the centerline. RSI has moved higher at 53 and is indicating bullish momentum to increase. Stochastic Oscillator continues in Buy mode as %K (overbought at 85) is above %D. MFI has moved higher (36) but still continues in Sell mode. The Directional Indicators are in Sell mode as +DI is below –DI. ADX has dropped to 19 which suggest that the trend is sideways. OBV has moved above previous minor top but is yet to register higher top higher bottom. Sell signal as per the Bollinger Band stands negated as the indices have managed a close above the centerline i.e. the 20dma. The Nifty O.I. PCR has improved and is at 1.35. For the August series, highest open interest buildup is seen at 5000 Put and 5500 Call. This suggests an overall range of 5000 on the lower side and 5500 on the higher side for this month. 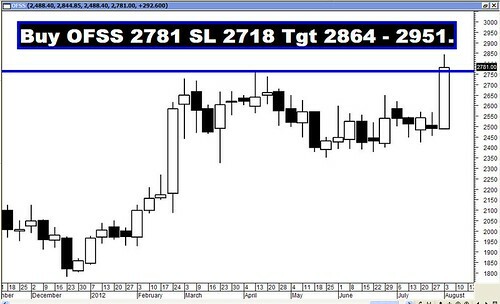 Friday saw a strong build up at 5300 Call which indicates that resistance near the level of 5300. Trendline Resistance for the Sensex is at 17535. The Trendline Support is at 16762. 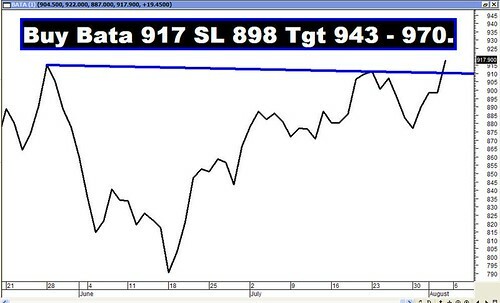 Trendline Resistance for the Nifty is at 5313. The Trendline Support falls at 5081. For the week ahead, Sensex will find Support at 16918-16636-16366 and will find Resistance at 17466-17731-18040. For the week ahead, Nifty will find Support at 5125-5032-4942 and will find Resistance at 5300-5385-5460.